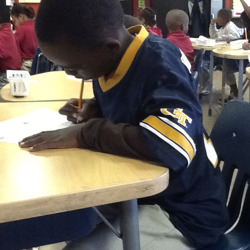 Aise Nature came to Cornerstone Prep Lester in the middle of second grade from the Congo. He spoke no English when he arrived, though he had attended school where he previously lived. I remember the first time I met Aise Nature. He was nervous, overwhelmed, and scared, but I very quickly learned something about Aise Nature: he genuinely loves to learn. From the beginning he was motivated, driven and focused. He has always wanted to follow the procedures of the classroom and complete his work to his greatest ability. Over the years he began to encourage those around him to do the same. He often would ask me for extra work or projects to do in addition to the homework his teachers were giving him. After just 4 1/2 years of being in this country, he has now qualified for ACE, the Cornerstone Prep and Lester Prep gifted program! He is extremely proud of his accomplishments and excited about the additional enrichment and knowledge he will receive in being a part of the gifted program next year! 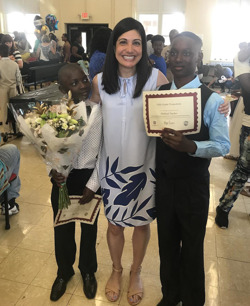 Aise Nature is just one of many examples of how our ESL students overcome great obstacles to become incredibly successful in their classrooms every day. We are honored to be a part of their journey!